He is notable as one of the pioneers of modern dance in Europe. His work laid the foundations for Laban Movement Analysis, Labanotation (Kinetography Laban), other more specific developments in dance notation and the evolution of many varieties of Laban Movement Study. The four key concepts of the language of movement and the Eight basic efforts have been used by dancers and actors to create dynamic movements on stage. The concepts occur along a continuum. SPACE : This can be flexible and unrestricted or indirect through to direct or bound. This include bodies in space and different use of levels as well as bodies through space. The notion of movement through space was a new concept. TIME: This included the rhythm and pace of the movement, the rate of the movement and the regularity of the movement. Music did not define time. A poem or silence could influence movement. WEIGHT: This was whether movement was with or against gravity. It could be light or heavy. Laban saw classical dancers as trying to escape the downwards pull of gravity. FLOW: Movement of the whole body or isolation can be described with flow. It can be continuous through to disjointed and sudden. 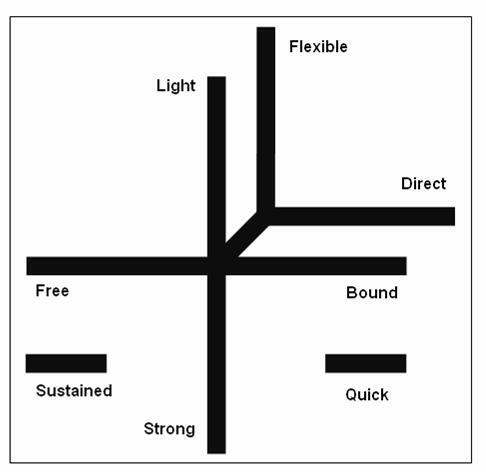 Laban created the Eight Basic Efforts from different combinations of the four concepts to create the a system that could be used to analyse all movement.